I’m not a great lover of gardening, as a hay fever sufferer I detested being forced to get out in garden to help out as a kid. I loved playing outside but the whole growing flowers and keeping the garden tidy irritated me in more ways than one! This has continued into my adult life where I have had to outsource lawn mowing in the past as I never seemed to get it done, and am now quite happy with decking/concrete in any outside spaces. That doesn’t stop me loving flowers though, and it was great to receive a bouquet from Prestige Flowers as a thank you recently. They’re currently brightening the window-sill of my office and, whenI remember to take a moment to just stop and look at them, they are lifting my mood too. 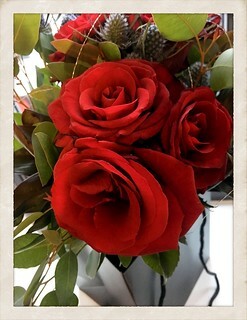 It’s amazing how big a boost a bunch of flowers, or a small gift, can be to your mood…especially in a grey January. I have to say I am really impressed with this Prestige Flowers bouquet, it arrived well packaged and unsquashed (always a good start) and the wrapped flowers were held in a gift bag (which is now hiding my makeshift “half a water bottle” vase). A nice touch for those of us that don’t always have flowers around and so have to make-do with what’s around in order to keep them fed and upright. The flowers came packaged with some food (essential to keep them fresh for longer) and some instructions for making them last. The card has guidance for a range of flowers, which is handy for the lesser-green-thimbed amongst us as who knew you had to look after roses one way, and freesias another?! The flowers themselves are gorgeous! 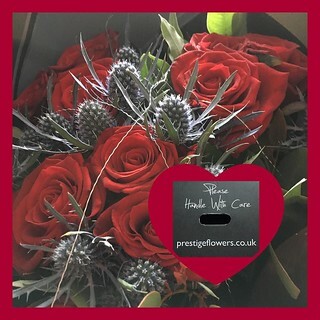 A mix of deep red roses and some blue-ish thistles….perfect for someone who is half-Scottish and more than a little prickly at times! They’re nicely presented with some additional greenery and some silver wire adds a nice touch of shine in the sunshine. 4 days on and they are looking marvellous, the roses have opened slightly but still look perfect, hopefully they’ll still be going strong next week too. Based on the flowers and presentation I would definitely suggest you check-out Prestige Flowers if you are looking to treat yourself, or someone else. With Valentine’s Day coming up, perhaps it is time to start dropping hints about their Valentine Flowers….or even treat someone else! 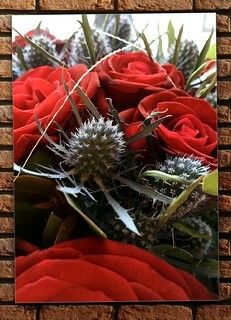 I am sure there are plenty of guys as well as girls who would love a surpise flower delivery, either for Valentine’s Day, or even just because! Perhaps you could even push the boat out and get a set with chocolates or a bottle of fizz! Do you find flowers a good mood booster? Or are you a chocolate fan for your endorphin rush?